Holiday Inn Glasgow-East Kilbride, with its air conditioned guestrooms, is centrally located in the bustling town of East Kilbride just 7 miles from Glasgow city centre. The motorway network is easily accessible too, as are Glasgow International & Prestwick Airports. 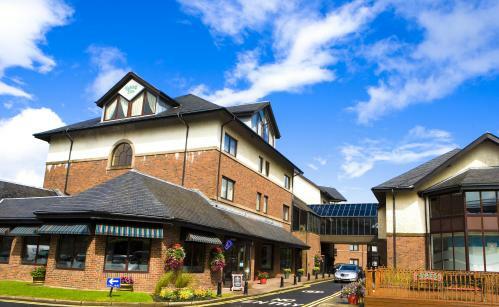 East Kilbride has lots to do visit East Kilbride Shopping Centre, one of Scotland&regs largest, stroll the cobbled streets of the old village or there&regs Calderglen Country Park. There&regs also golf, ten pin bowling, a cinema and ice rink. M&D&regs Theme Park and Hampden Park, Scotland&regs National Stadium are close by too. Why not head to Glasgow for Kelvingrove Art Gallery, Glasgow Science Centre or some of the best shopping outside London. If you&regre in Glasgow or East Kilbride on business, our air conditioned meeting rooms for up to 400 delegates plus high speed Internet access throughout the hotel create the perfect working space. Complimentary for guests, our impressive Triangle Health & Fitness Club, with its indoor pool, is perfect for unwinding. Our new La Bonne Auberge Bistro, opened this summer, and brings casual, relaxed dining with a hint of French flair to East Kilbride&regs restaurant scene.